The Traser H3 Aviator Jungmann is based on the success formula of famed aviator Carl Clemens Bucker: efficient in design, first-class features and easy to maintain. The Aviator Jungmann excels in every area. Inside the Traser H3 Aviator Jungmann is the exceptional Caliber 5030.D Ronda Swiss quartz movement. 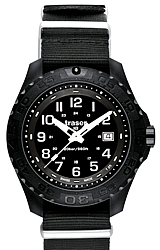 This Large Man's Watch has a 46 millimeter Stainless Steel Frame with an anti-reflective coated Sapphire glass crystal. 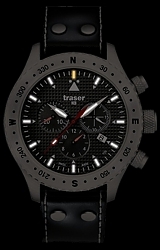 The rotating bezel 360 degree compass design provides you with a simple but efficient aid to orientate yourself more easily; and the unique Trigalight lighting means the Traser H3 Aviator Jungmann can be read perfectly at all times, whether it be day or night.